What could hold more country kitchen charm than an embroidered French chicken weathervane? 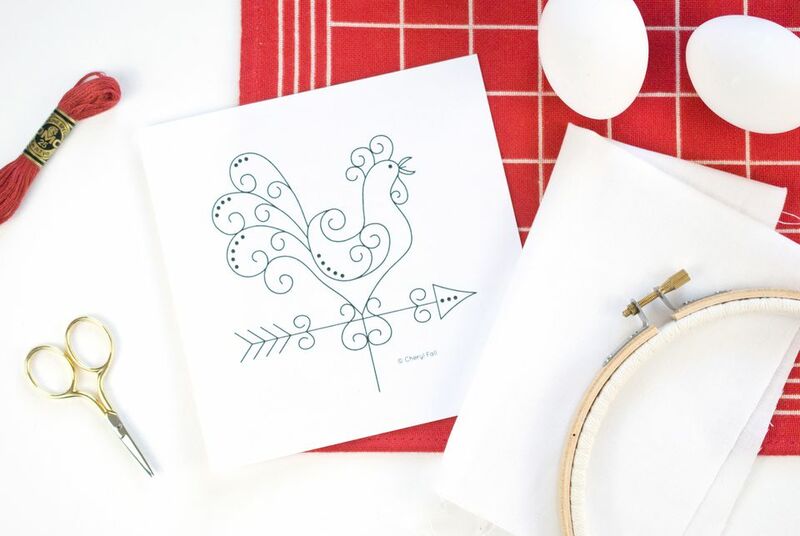 Also known as a chanticleer, this rooster pattern is designed to be worked in traditional redwork hand embroidery using basic stitches, making it a great beginner project! Even though this pattern has plenty of sweet details, the simplicity of the stitches makes this a project that works up quickly. You only need to know two basic surface embroidery stitches: stem stitch and French knots. Redwork is traditionally worked with red thread on white or natural-colored plain weave or evenweave fabric. When you are working with a bold color of thread on light fabric, even small jumps between areas will show through the material. To remedy this, iron a layer of midweight fusible interfacing to the back of the fabric. And while redwork gets its name from stitching in red thread, you can certainly stitch this pattern in any color you like. You could even embroider your chicken weathervane in full color! If you're looking to add some French country charm to your kitchen, use this design on a ready-to-stitch towel. The chanticleer would also be adorable paired with gingham fabric on a DIY pillow. The pattern for the Redwork Chicken Weathervane is given here as a downloadable JPG file, and can be easily enlarged or reduced using your computer's photo editing software. First, test your embroidery floss for colorfastness. Fold the square of fabric into quarters and mark the center point of the base fabric. Center the pattern under the fabric and trace the embroidery design onto the fabric using the water-soluble fabric marking pen. If you have difficulty seeing the pattern through the fabric, use a light box, or trace the design by holding the fabric and pattern up to a window. You may also wish to use an alternate marking method, such as water-soluble stabilizer. Embroider the design using 2 strands of floss in the needle. Use the stem stitch for all lines and a French knot for each dot. If you are embroidering this at large size, consider working with 3-4 strands for a bolder line. When the embroidery is finished, soak your finished work to remove the pattern markings. Even embroidery floss that is labeled as colorfast can bleed, especially with reds. If this happens when soaking, gently wash your embroidery with a laundry sheet designed to grab or catch color. Carefully iron your embroidery and finish it as desired. This pattern is copyrighted © by Cheryl Fall and free for your own personal use only.